Look out! Look out! Yr1 are about! Good weather, good humour and an ability to challenge assumptions, brought the Yr1 ComDes students out into the streets of Glasgow recently. Working in groups of five, the students took some risks to make places in Glasgow famous. We had: commemorative plaques dedicated to singer songwriter Darius, sheltering walkers in Kelvingrove Park under a canopy made from a matrix of umbrellas, turning the Duke of Wellington statue into Dukearoo! 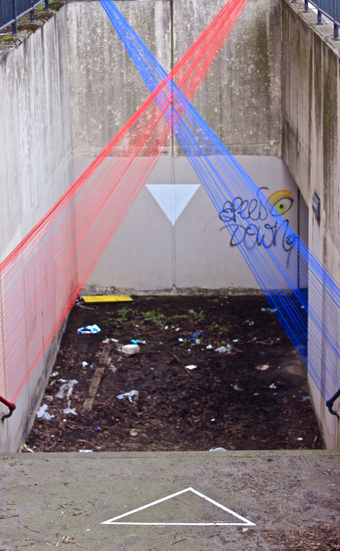 (his equestrian pal had a unicorn horn) and a forgotten underpass near to SkyPark brought to life with an installation made from woolen thread (see below). The thread installation looks great. Hands down beats our idea to host a flash mob in an abandoned public toilet. I saw this a few days ago – it looks fab!! !